Their child will come behind Harry in the order of succession, making this baby 7th in line for the throne when it comes. 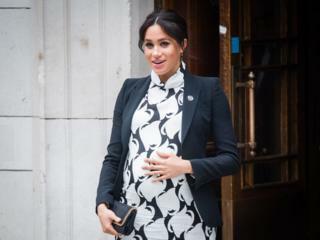 During a visit to Birkenhead, Meghan - the Duchess of Sussex - told members of the crowd when she's due to give birth and said her husband Harry will make "a fantastic father". Some people think the baby will born on Easter Sunday which is also the Queen's birthday. So how much do we know about the baby? Read this and then test your knowledge about other royal babies at the bottom of this page. Quiz: Do you know your Royal babies? We don't know yet, and if Meghan and Harry know, then they aren't saying. 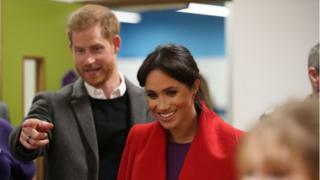 On their first royal visit of 2019, Meghan and Harry spoke to a group of youngsters from a primary school in Birkenhead where they were questioned about the gender of their unborn child. Kitty, aged nine, said after meeting the pair: "I asked her if she was having a girl or a boy and she said she didn't know." Will the child be a Prince or a Princess? The answer is that she or he won't automatically be a princess or a prince. According to a ruling by King George V in 1917 , only the oldest son of the Prince of Wales's oldest son (so that's Prince William's son, Prince George) was entitled to be called His Royal Highness (HRH) and a Prince. Then in December of 2012, the Queen made new rules that said that ALL all of William and Kate's children would hold the title of HRH and would be styled as princes and princesses. 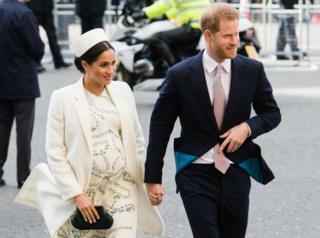 So far, that ruling does not apply to Prince Harry's and Meghan's children, and so if it's a boy, some royal experts think he could be styled as Earl of Dumbarton (following one of Prince Harry's titles), and if it's a girl, she could be given the title of "Lady". But the Queen might give Harry's child a totally different title when he or she is born, so we'll have to wait and see on that one. 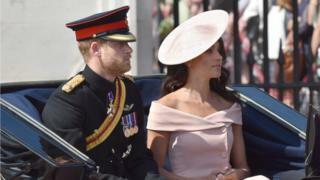 Harry and Meghan have just moved house ahead of their baby's birth. 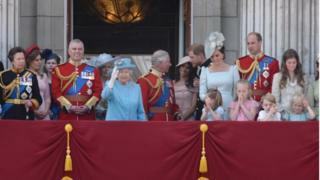 They've left Kensington Palace to live in a new home in the grounds of Windsor Castle where they got married. The couple used to share Kensington Palace with lots of other royals - it's where Prince William, Kate, Charlotte and Louis live - but they've now moved to Frogmore Cottage in Windsor. The name Frogmore comes from the frogs which have always lived in the low lying marshy area. What name will be chosen? Good question - some names work for boys or girls but it probably depends on which the child is. Royal names are often influenced by other royals from history. At the moment Elizabeth looks like it could be one of the favourites if they have a girl, in honour of the Queen. Other top contenders are traditional names like Victoria, Charles, James and Alice. Diana is also in the running, after Harry's Mum. According to some reports, during that meeting with kids in Birkenhead, one boy suggested the name Amy - and apparently the duchess said: "That's a really pretty name, I like it, we'll have to think about it." What do you buy a royal baby? Harry and Meghan have already received loads of gifts for their baby. They've been given everything from a pair of wellies to LOTS of soft toys (they've got more than 90 of them already!). The presents are all on a list of official royal gifts to members of the monarchy. Some of the more unusual gifts include a child's lifeguard outfit and a wetsuit for when the child is older. Now the couple has their own Instagram account we wonder if they'll announce when their baby's born on there? Don't worry though, as soon as there's any update Newsround will be on it like a flash! 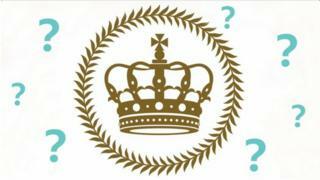 Now, test your knowledge about these other royal babies. Quiz: How well do you know your royal weddings? Well Done!You know your royal babies! 7/7 and I like the name Alice. This is my score from the quiz above!